Utah Departments of Transportation snow plow clearing the July 7, 2012, fire-related debris flow deposit from State Route 31 in Huntington Canyon (photo courtesy of Emery County Sheriff’s Department). The 2012 Seeley fire was a lightning-caused fire that burned 75 square miles (48,050 acres) on the Wasatch Plateau in central Utah. The fire, which started on June 26 and was contained on July 18, was approximately 15 miles northwest of Huntington and about 12 miles east of Fairview. Thunderstorm rainfall on July 7, 2012, produced fire-related debris flows and flooding, causing damage to State Route (SR) 31 and Huntington Creek in Huntington Canyon. Additional thunderstorm rainfall in 2012 produced debris flows and flooding on July 16, July 30, July 31, and September 1, 2012. To date in 2013, rainfall produced debris flows and flooding on July 16 and 18. These rainstorms show how prone the steep, burned slopes are to generating debris flows and flooding. 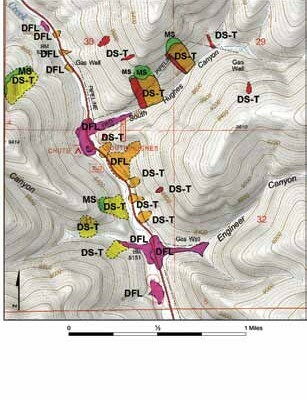 The Utah Geological Survey (UGS) and the Manti–La Sal National Forest (MLSNF) modified an existing cost-share agreement to focus on landslide inventory mapping of the Seeley fire burn area. The map and accompanying geographic information system (GIS) geodatabase show and characterize landslides (including debris flows) within the burn area to provide information to manage potential post-fire landslides and to prioritize areas where risk-reduction measures are needed. 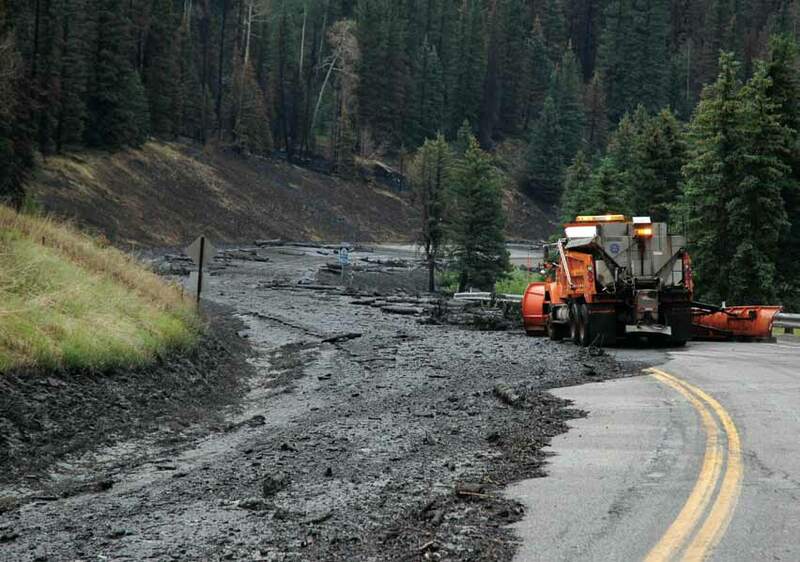 Debris flows are the most common type of landslide following a wildfire and are triggered when intense thunderstorm rain falls on steep, burned slopes. Debris flows are mixtures of water and sediment, and in the Seeley fire area, the sediment consists of boulders, gravel, sand, mud, burned tree trunks, partially burned organic matter, and ash. Some flows contain more water than sediment and are fluid, having a consistency similar to a dilute milkshake. Other flows contain more sediment than water and are more viscous, having a consistency similar to wet concrete. Fire-related debris flows occur when wildfires leave bare ground and little vegetation to intercept intense thunderstorm rainfall, increasing surface-water runoff. The runoff water concentrates in stream channels where it erodes and incorporates loose channel sediment to form debris flows. The debris flows continue to erode channel sediment and increase in volume as they flow down steep mountain channels until they reach an alluvial fan at the channel mouth and spread out, depositing sediment. Debris flows are one of the most dangerous post-fire hazards because they can be life threatening, move rapidly, and strike with little warning. Debris flows are generally more damaging than water floods because of their destructive power. Debris-flow density, thickness, and velocity can combine to produce large impact pressures, and flows can destroy buildings, campgrounds, roads, bridges, culverts, and other infrastructure in their path. 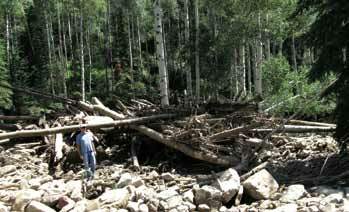 Thirteen of Utah’s fifteen debris-flow fatalities occurred in campgrounds at night, where fast-moving debris flows struck with little warning and left victims with no time to move to a safe location. The UGS worked closely with the MLSNF during and after the Seeley fire, providing fire-related debris flow hazard information to understand risks and potential impacts. The MLSNF put closure notices and travel restrictions into place for debris-flow areas and other post-fire hazards (such as flooding, falling and rolling trees, and falling rocks) to protect public safety. 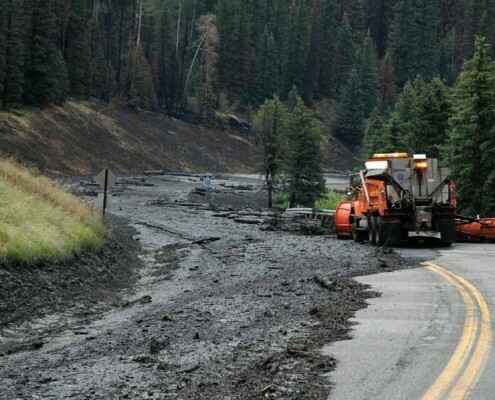 The fire and intense thunderstorm rainfall that followed, transformed the area into a landscape that produced debris flows and floods that damaged SR 31, other roads, trails, recreation sites, fisheries, and water sources for power generation and local irrigation systems. The Seeley fire occurred within a popular recreation area notable for its scenic viewing, camping, hiking, fishing, and hunting. The area is also tied financially to several local industries including coal mines, coal-fired electrical power generation, livestock production, and natural gas wells and distribution pipelines. SR 31 through Huntington Canyon is a National Scenic Byway and the highway is the only paved route across the Wasatch Plateau. We prepared the landslide inventory by analyzing and interpreting 11 sets of stereo and orthophoto aerial photography acquired periodically from 1938 through 2011, which provide a 73-year history of landsliding in the burn area. The characteristics of each historical and prehistoric landslide are recorded in the GIS geodatabase. The Seeley fire area has fewer landslides than other areas of the Wasatch Plateau because the rock units underlying the steep areas are stronger and therefore produce fewer landslides. Rock units in the burn area consist of the Mancos Shale, Star Point Sandstone, Blackhawk Formation (shale, siltstone, sandstone, and coal), Castlegate Sandstone, Price River Formation (sandstone and shale), and North Horn Formation (shale). Elsewhere on the Wasatch Plateau, numerous landslides occur in the North Horn Formation, but within the burn area, only a small area of North Horn is present, mostly on gentle slopes that do not produce many landslides. To date our mapping indicates a minimum of 32 firerelated debris flows in 2012 and 2013 (following the fire), in addition to many potential debris-flow areas. The potential for fire-related debris flows is highest immediately after a fire and will decrease as vegetation is reestablished. For the Seeley fire the potential for debris flows and flooding will persist until the regrowth of vegetation stabilizes burned hillslopes, intercepts rainfall, and buffers runoff. 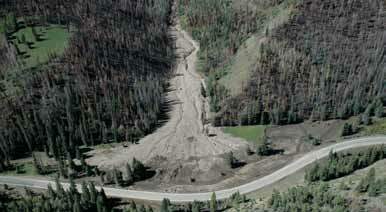 Most fire-related debris flows in Utah and the Intermountain West occur within two or three years following the fire. Drought conditions can limit vegetation regrowth and result in a longer recovery. The UGS landslide inventory map will help the MLSNF manage the post-fire potential for debris flows and other landslides as vegetation recovers in the Seeley fire burn area.